I’m now running my own photography business full-time, but my background includes 15 years in corporate marketing strategy. I don’t regret that career, or my MBA, for a second, because no matter what I’m doing, it’s the marketing aspect I love most! 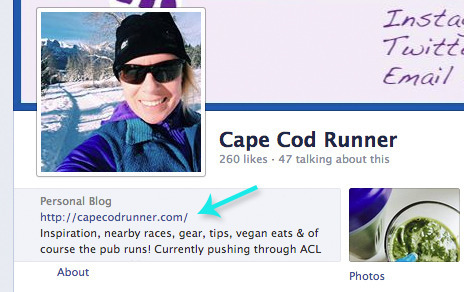 So, for sure, when I created this running blog, I got to put a lot of my marketing experience to use. It was never intended to be a money-maker or anything, but I’ve had a lot of fun with branding and the viral, community-nature of social media! But this is about YOU! Just some things I think about when checking in on all my favorite running bloggers – I hope these tips help your community grow! 5 tips for marketing your running blog! Face it! : Your face is all over Twitter, Instagram, Facebook and more, so make it count! People will identify with you much better through a close-up photo, maybe shoulders-up, to see your face. If your whole body is in the photo, a favorite race-day finish perhaps, chances are we have NO idea what we’re even looking at (a human figure?) in that tiny photo. Mix it Up: Don’t just post the same status or photo everywhere at the exact same time… consider each audience and share, ask questions, prompt discussion in different ways. Give us a reason to follow your Instagram AND your Facebook page, know whattimean? 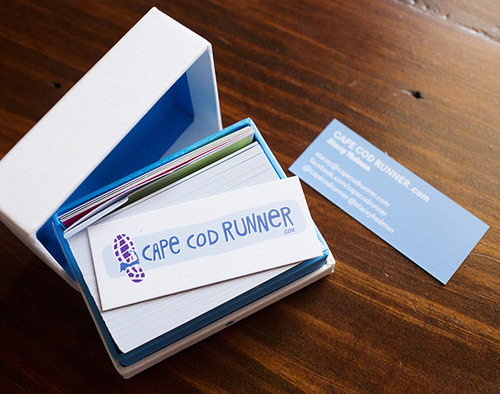 Business Cards: Consider fun “business” cards, like Moo’s MiniCards, that contain your information as a runner! This is no longer just for the office – tons of moms are carrying cards with contact information for a playdate! MiniCards even have a thin plastic case to protect them from sweat on your next group run! Great Photos! : I admit, I looove that this blog allows me to use just iPhone photos and videos. BUT, you really do need to edit them at least a tiny bit. Grab an app like Afterlight to be able to brighten, crop, straighten and boost color a bit! Use apps like WordSwag or FontStudio to add text. And last but not least, for any social media at all – blogs, Facebook Instagram, Twitter and more, I HIGHLY recommend Canva.com for your design needs! No need for Photoshop expertise here – just easily find your dimensions. add any of the dozens of free add-ons (text, graphics, frames) , and download the free web file right to your desktop! Any tips you want to add? I tried to pick just five for today, but I’d love to hear your thoughts! Please feel free to share in the comments below!